There’s one thing you have to know about Glass and Gardens: Solarpunk Summers is the perfect anthology for summer. It’s also the perfect anthology for me at this moment. I’ve been feeling a bit demoralized and scared for the future. But Glass and Gardens examines the future with optimism and everyone I’ve told about this anthology wants to read it now. So can I just say I’m in love with the premise? That is what drew me to the book and it didn’t disappoint. 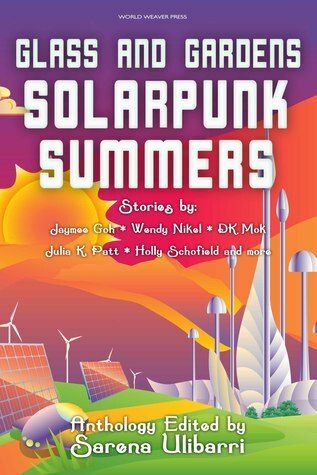 This anthology gives you just enough story, science, and hope. The world building isn’t ever heavy handed, it’s light feeling. You never feel bogged down. There’s such a variety in the stories. We read stories of dating deal breakers, mentorships, and clever technology. While the book is about the environment, and the future, it never felt pessimistic. Certainly things aren’t looking great – a lot of change has had to happen – but it never feels apocalyptic. It feels like the world is taking another breath – a new start. I’ve been needing a book like this in my life. I needed more optimism – tales of the future that didn’t feel like a nightmare. I wanted to read SF that had less to do with how things could actually go and more to do with what our future could hold. Check out Glass and Gardens on Goodreads. I know this review was short and sweet, but I have nothing but good feelings for this book and highly recommend it. What is the last short story you read?